Only once in their great rivalry have Novak Djokovic and Rafael Nadal met at the Australian Open, and it is a match that will go down in history. The 2012 final at Melbourne Park will never be forgotten after Djokovic secured the third of his six Australian Open titles following an enthralling battle lasting almost six hours. This was an epic between two greats perhaps at the peak of their powers, at the time – just like they are heading into Sunday – ranked the world's two best players. Coming off a semi-final lasting almost five hours against Andy Murray, Djokovic won another battle 5-7 6-4 6-2 6-7 (5-7) 7-5 over Nadal, in a match that went 5:53 – the longest major singles final in the Open Era. Incredibly, that is the only previous meeting between the greats in Melbourne ahead of Sunday's final. Djokovic has since added nine grand slam titles to his name to get to 14 overall, while Nadal has won seven to move onto 17. Then in their mid-20s, Djokovic and Nadal delivered a final for the ages seven years ago. The points were long as the pair put on epic rally after epic rally, two of the greatest defences in history going head to head in a gruelling clash. It took more than three hours to get through three sets before rain briefly interrupted proceedings in the fourth. Djokovic was 5-3 up in the fourth-set tie-break, but Nadal won the next four points, memorably falling to his knees to celebrate levelling the match. Nadal broke for 4-2 in the deciding set but was unable to consolidate, Djokovic taking the Spaniard's serve again in the 11th game before closing out an incredible win, ripping his shirt off and roaring in celebration after a match that finished around 02:00 local time. A repeat of that is near-impossible, particularly with Nadal trying to shorten points on the back of a remodelled serve that has seen him in blistering form. Nadal won the two hard-court meetings against Djokovic after that final, including in the 2013 US Open decider, but has lost seven straight since without winning a set. 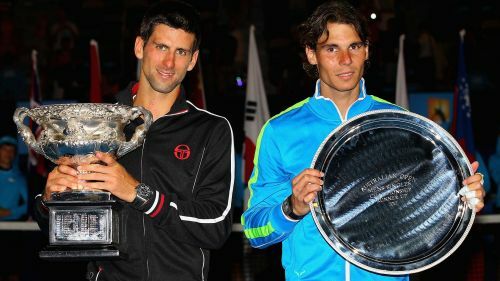 It may be a little different compared to 2012, but Nadal and Djokovic are sure to deliver again.